A coloured concrete driveway might seem like a pretty simple feature to achieve. All you do is choose a colour, right? Well, not exactly. 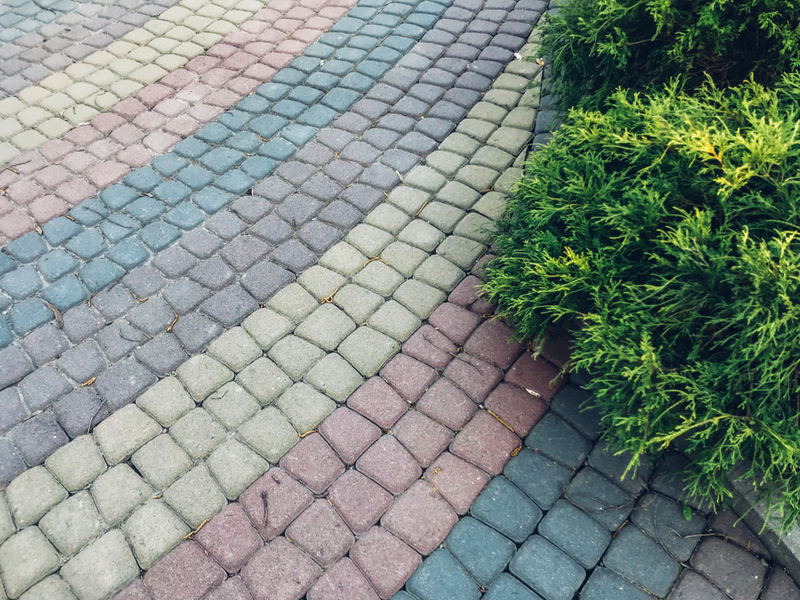 There are actually two types of coloured concrete, and you should know them both before you choose one for your coloured concrete driveway. Today we are exploring both integral and topical colours. We’re looking at the pros and cons of each method and which one you should choose for your driveway. Integral colour is a powdered, granular or liquid formula that is mixed in with the concrete to produce an even, rich colour. The pigments that colour the formula are usually a blend of synthetic pigment and iron oxide. The most common colours in the integral colour range are browns, tans, greys and dulled reds (i.e. earthy tones). The main pro of integral colour concrete is that the colour doesn’t budge. Yes – even under harsh weather, surface abrasion or UV light, the colour in the concrete is permanent. This is perfect for a coloured concrete driveway as driveways are often exposed to the elements. Often, the colours that are available for integral colour are earthy-toned. This is a pro because these kinds of colours match well with most homes, making integral colour aesthetically ideal for driveways. With integral colour, the entire batch of concrete is evenly coloured at the same time, since the colour is mixed through. This means that there will not be any uneven patches of colour once the concrete is laid. The main con of integral colour when comparing it to topical colour is that there are not as many colour or stain choices available. However, as mentioned above, the colours that are available for integral coloured concrete are typically earthy tones. For a coloured concrete driveway, earthy tones are ideal anyway since they match the appearance of most homes. Topical colour is a kind of stain or dye that is applied to the surface of the concrete after it has been laid. There are a few different types of topical colours and finishes. Three popular ones include acid stain, dye and water-borne stain. The main pro of topical coloured concrete is that there are so many options when it comes to colours and finishes. From dyes to acid stains, you will be able to achieve a wide range of looks for your driveway. While the choice is vast and varied, you should be warned: not all finishes are suitable for all areas of the home. It’s important to do your research and find out what will work best for your driveway. Replacing concrete is inconvenient and expensive, so you don’t want to make a mistake. Another con is that topical colour fades over time. Because topical colour is applied to the surface of the concrete, it is subject to fade over time. If you’re after a coloured concrete driveway, this is bad news because faded colour alters the entire façade of your home and will cost you more over time due to maintenance costs. If an experienced contractor does not apply the stain or dye, there is a good chance that the colour may turn out uneven. This is obviously not good for the overall look of your home’s façade. What should I choose for my coloured concrete driveway? The driveway is a high-traffic area that is attached to the most visible part of your home. Therefore, an integral coloured concrete driveway is likely to be ideal for most homes, as the colour is permanent and won’t need to be touched up again. Over time, integral colour is going to save you valuable effort and money, all while looking just as beautiful as the day it was laid. At A Better Driveway, we mix quality oxides through our integral coloured concrete. This gives your coloured concrete driveway a lasting, elegant finish through years of use. As a reputable business that has been operating for over 20 years, you can be sure that A Better Driveway handles the job with professionalism, honesty and skill. Don’t hesitate to contact us today to find out more about how we can help you achieve the perfect coloured concrete driveway for your home.